Sure New Haven has Yale University, but did you know they also have the Knights of Columbus Museum? For some reason, I think I expected a crummy old museum with worn out memorabilia from days gone by. I couldn't have been more wrong. 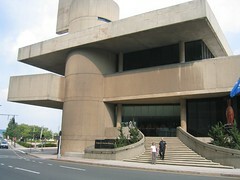 This concrete monstrosity sits in downtown New Haven right off of the highway. There are nice parking lots available under the building and an elevator to the lobby. Stepping off of the elevator into the Lobby, all I could think was “Wow. I am so underdressed.” The museum is spectacularly clean, well-kept and has some really incredible exhibits. A uniformed docent immediately greeted us and tried to get us settled into the museum. It was like having your own personal museum assistant. They checked our bags and sent us off to the first exhibit. The traveling exhibit at the time was a replica St. Peter's Basilica in Rome. Definitely the closest you'll ever get to the detailed insides of the Dome. This exhibit was thorough, interesting and extremely well done. Thrilled to find such a great, free treasure, we wandered on. I lagged a little bit behind Beth, examining the window displays on the Knights of Columbus. I saw Beth enter a room on the left and shortly after beeline out into the main exhibit area again. I looked at the sign and saw that it was an exhibit on the founder of the Knights of Columbus, Father Michael MacGivney. Interested in learning more about this organization's roots, I wandered in myself. Looking around I saw some exhibits on him, but in the center of the room, exhibit cases held his vestments and robe. Delighted to see something that he had actually worn I went over and started looking at the clothing. I noticed that he seemed to be short and then I noticed fraying and deterioration around the edges and bottom of the robe. I thought that strange and unusual, it looked like they had rotted. This is when I noticed that the Knights had exhumed his body and reburied him in a place of honor. In the process, apparently they had removed his clothing. Hence, the reason for Beth's beeline. I was staring at a dead man's coffin clothing that he had worn for almost one hundred years. For some reason I felt this was inappropriate and I made a beeline to the door. But we still recommend this museum if you're at all curious as to what the Knights of Columbus do and how long they've been around. You'll definitely know by the time you leave this museum.